This plant arrived as a seedling twenty years ago and has grown into a terrific specimen needing both Amalia and Pip to carry it. The species is native to Mexico where it grows in open deciduous oak forrest. 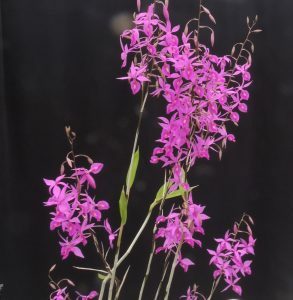 Each year long can like stems grow and produce spikes covered in glorious pink flowers and this year we have a better display than ever before. We find that barkerias have to grow mounted as roots quickly rot when we pot them. The abundant roots seem to thrive when out in fresh air where they dry quickly after watering. We spray plants heavily during the summer when in active growth but reduce watering in the winter when the plants become semi-deciduous. This plant has become a monster specimen and is rather difficult to keep tidy as it sprawls around a bit but the species has the great habit of flowering on very young plants and this first flowered two years out of flask with just two flowers.This year there are 237 flowers or buds and the stems often produce a second flush of flowers after the first flush finishes. I think this orchid is fantastic and very aptly named being long and thin. I love the pink flowers but think it is a little too large for a normal sized house. Absolutely brilliant! Haha – yes ‘skinneri’ as in skinny! 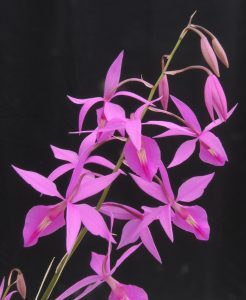 Actually the species is names after George Ure Skinner a remarkable British merchant and naturalist who made his home in Guatemala in the early 1800’s and was significant in generating interest in orchids in the Britain. Oh yes he discovered Odontoglossum Uroskinneri too didn’t he. Did he name any others after himself? He did discover it but the naming was done in his honour by the botanist he sent the material to. Naming a plant after your self is poor form. 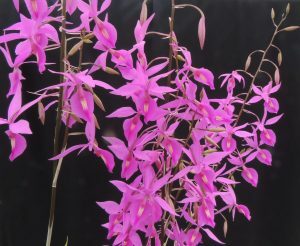 Does the of the Veitchii Orchid originate from the company of Veitch and Son where Skinner sent orchids he had collected? I have an Asesquinedale x Veitchii orchid and wondered if there was a connection? 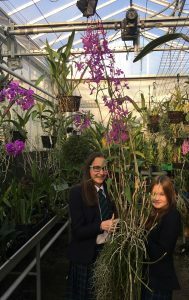 Yes there are lots of veitchii, veitchiana in the plant names of victorian discoveries – and I believe that there is a history of the Chelsea nursery available. Apparently the Veitch nursery that George Skinner and 22 other plant hunters collected plants for was started by John Veitch in Budlake near Killerton around 1808. In 1832 he and his son James bought land at Mount Redford in Exeter. In 1853 a nursery at Chelsea was purchased. By 1914 Veitch and Son were responsible for introducing 232 orchids. Yesterday I visited Killerton in Devon which was built in 1790. John Veitch designed and built the gardens there before he started his nursery. The gardens are full of what would have been, in those days, very exotic trees and plants. What I find amazing is in 1790 there were no trains or good roads and even the Grand Junction and Grand Union Canals had not been built. Everything would have been taken by horses. It must have been so difficult for early plant hunters and collectors. Weren’t they truly amazing people.